It's all about bombastic graphics and a hell of explosions. With CAVE's launch of their first shooter title carrying that strange name 'DonPachi' (lit. 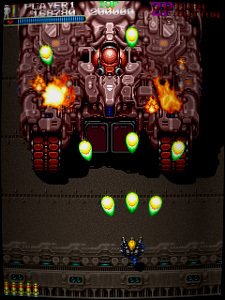 "bee boss"), truely a new generation of arcade games began. Such a density of monstrous spaceships, beautifully drawn with a myriad of details, was nowhere seen before. So where did this company come from ? Maybe the fact that the boss of CAVE is a former Toaplan member clears it a bit. So probably we should see this new generation of shooters as an evolution of Toaplan (Truxton II, Dogyuun, Outzone...) games. 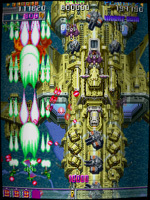 In DonPachi you choose between 3 types of spaceships. 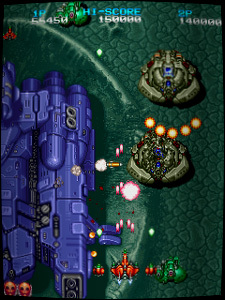 All feature a main lasergun that shoots nice salvoes by continuously pressing the [A] button. By holding the same one, the satellites escorting your ship all the time, will transform your weapon into a some kind of a 'waterfall of energy'. This is a very powerful gun that blows the most of your enemies to dust in no time. There's just one problem: It makes your ship moving quite slow. So you don't want to play the whole game by holding that button. I'm sure you will find your own balance between these two weapons after a short time of practise. Furthermore there is a smartbomb to be launched with the second button [B]. When you just press it, the bombs detonation will affect a wide range of the playfield. If you press it while you just mow the screen with that laserfall, it will turn that weapon into an insane "don't-know-how-to-call-it-ray-cannon". Speaking of playability, DonPachi's collision detection is very fair. Otherwise it would be hardly possible to avoid all the dozens of bullets on the screen. Unfortunately this game has only 5 different stages. To finish the whole game, you have to play it twice. After stage 10 you will finally enter the realm of the bee boss; which in fact is a coin trap, since it's almost impossible to beat that mad shooting bee mech thingy without getting hit. 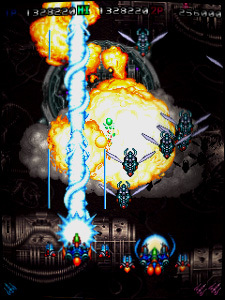 The first time you try DonPachi you probably doubt that this game is playable without an excessive use of the smartbomb and without having hands on a tower of coins placed near the cabinet. There are just too much optical effects attacking your eyes. But after a few coins you will get more and more confortable with it, and you will probably experience that this baby is very much playable and has a high replay value. Did I mention the sound ? Very nice orchestral tunes will spoil your ears here. Actually not that great than in later CAVE games (ESP Ra.De or Guwange) but much enjoyable with many nice speeches "Concentrate kid !" or "Keep your eyes on the trigger ! ".